Volunteer work can teach your teen a lot of valuable life lessons. 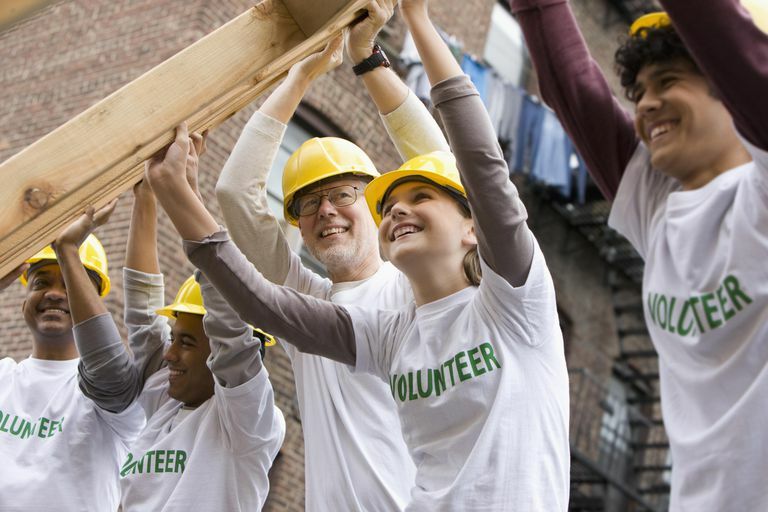 Whether you want your child to learn the importance of giving back to the community or you're hoping she'll gain some valuable skills that will help her in a future job, there are lots of local volunteer opportunities. The American Red Cross has an entire youth section called the Junior Red Cross. Youth can organize a blood drive, become educated and ready for disaster relief or train younger children in home safety. The Red Cross many opportunities throughout the year for youth, as well as programs for adults that teens can do too, such as their knitted items program. Check out the national website to find your local chapter. A soup kitchen in your area may serve meals one or two times a day and are always in need of dishwashers and general help for the serving of food. Some soup kitchens may have age restrictions due to local laws about teens working in kitchens. But your teen may still be able to serve food or assist with set-up and clean-up. Hospitals and nursing homes are often looking for volunteers to perform a variety of duties. Your teen may be able to make photocopies, direct visitors, or work in the gift shop. Contact your local hospital to see if they accept teenage volunteers. Food banks need donations as well as helping hands. Even if your teen doesn't have a lot of time to work in a food bank, she may be able to participate in fundraisers. Food banks may also need help sorting food, carrying boxes, or handing food out. Contact your local food bank to learn how you can best assist them. Habitat for Humanity has a Youth United program in which the youth in your organization can plan and build a home for a local family. They use teen volunteers to assist with a variety of jobs and it can be a very rewarding experience for teens to get to see first-hand how their work helps a specific family. Libraries often enjoy having volunteers to assist them with cleaning, organizing, or checking books out. They often have a variety of programs during the summer months. Your teen may be able to get involved in helping read to younger children or organizing a special themed day event for kids. Some Meals on Wheels programs seek volunteers to make small crafts that can be delivered to the elderly along with their meals. A small little treasure that is placed on a tray, like a napkin ring, for example, can brighten someone's day. Contact your local Meals on Wheels program to see if they have opportunities for your teen to get involved.